How To: Schedule Posts for Your Facebook Page - SmackSmog! Trying to learn how to manage your organizational and business social media accounts can be daunting. Even if you start hitting a rhythm, or feel like your “getting it”, it still requires you to learn the tango in the time and resources dance. Since many organizations manage their own Facebook Page, you may find yourself scrambling for content at times. (I do!) It’s 3.45pm, and we realize we haven’t posted anything since the end of last week. 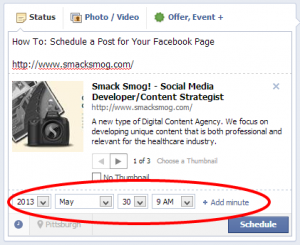 “Oh no, I’ve got to put something out there!” What if we told you there are better ways, that you can actually schedule posts for your Facebook Page? “What’s that? I can put together some updates and plan them out all at once?! ?” Indeed. You are not the first person to have been pleasantly surprised by this wondrous, yet small, tool. Upload your image, paste the website URL, and craft your status. Note: If this is the first time you’ve ever tried to schedule posts for your Facebook page, you will be prompted to set the date for when your organization was started. You won’t be able to schedule other updates until this is done. Don’t create an entire post in the box; you’ll loose all your work when it bounces you to the settings page. Just type gibberish, go to Step 2, and follow the directions to finish your timeline. Than come back to Step 1! 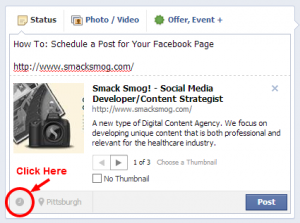 Adding your Facebook update content. 2) Click on the Clock. Once you add the year, a the month day and time links will show up. You can limit the details to anyone of the time markers; if you an event that ran the whole month of September of 2011, there’s no requirement to add the day or time. If you do just choose the year, you’ll have the option to preventing it from going in the news feed. If you use your timeline for sensitive time keeping, or have an event that isn’t relevant to your current business or clients, it will be on your timeline but it will not be seen by your fans once you schedule it. How detailed would you like the time for the post? You’ll notice that once you begin with planning the year, the clock at the lower left turns blue. If you change your mind and you won’t to post right away, you’ll have to start over. Also, as minutes are broken down as increments of 10, you’ll have to schedule at least 20 minutes out from the current time. 6) Congrats! You Learned How to Schedule Posts for Your Facebook Page! Once you schedule a post, you will be prompted to visit the Activity Log to view all of your posts. Anything scheduled in the future can be deleted or edited for time, but not content. If you decide to change the wording or find a mistake, it must be recreated. You’re prompted to see the update in the queue. You can view your Activity Log at any time, should you find the need to reschedule your post/s. At the top of the page is the Admin Panel; choose Edit Page, followed by Activity Log in the drop-down menu. Finding your post in the Activity Log from the Admin Panel.